Indira Gandhi National Open University has emerged as the largest university in the world. The mandate of the university is to provide access to higher education to all segments of society; to offer high quality, innovative and need based programme at different levels; to reach out to the disadvantaged by offering programmes at affordable cost. 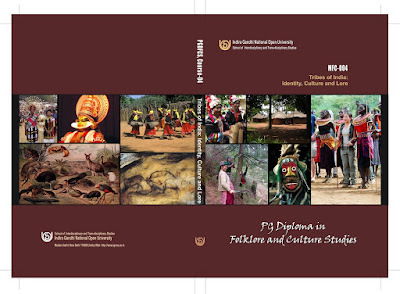 IGNOU is offering a PG Diploma Programme on Folklore and Culture Studies from the School of Interdisciplinary and Trans-disciplinary Studies, IGNOU. 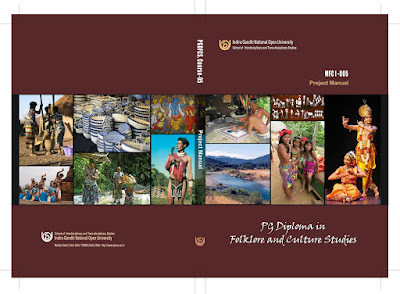 This Programme may be suitable for any graduate who wants to enter tourism, archaeological development or management of museums, NGOs working for Tribal Rights, Academic Institutes offering programmes on Folklore and Culture Studies. 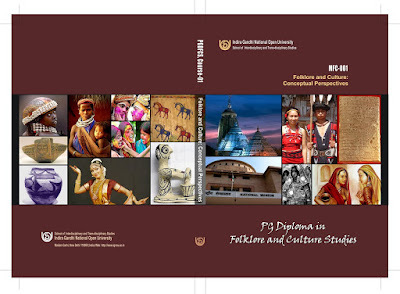 The programme PG Diploma in Folklore and Culture Studies aims at (a) studying folklore and other related cultural forms and (b) achieving this by situating them in their social context. The programme aims to explain to the students why communities in different regions have different kinds of folk traditions or why communities in different regions could also share certain similarities in their folk traditions. In other words, the course explores what are the different ways in which folk traditions spread from one community to the other and under what conditions such exchanges of traditions take place. There are units that discuss how factors like migration of people, contact among communities through trade and commerce, or different kinds of political contacts result in exchanges of elements of folk traditions among communities. At the same time, the units also discuss how despite these exchanges, the folk traditions of different communities continue to remain distinct, i.e. they do not become same. There are units that discuss how and why folk traditions are part of these haute cultural forms. Most of the discussions in the respective units are based on examples from South Asia. In fact, the course tries to address the folk traditions that abound in the region. Folk traditions are closely related with the economic, social and political life of a community. Therefore, various units of the course discuss in detail how economic, social and political factors affect the nature of cultural forms, including folk traditions. They elaborate on how, as a result of these factors, folk traditions undergo changes while at the same time certain elements of these cultural forms continue to survive with hardly any change. 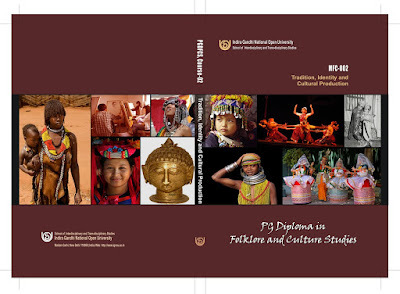 The Programme PG Diploma in Folklore and Culture Studies primarily focuses on time, geography, space and literature of the folklore and culture of the world in general, and of India in particular. 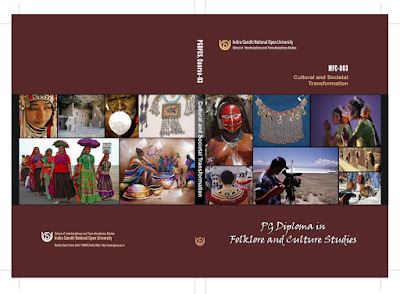 The Programme aims to find out the relation between folk culture and context through various frameworks borrowed from disciplines such as Literature, History, Sociology, Anthropology, Folklore Studies and emerging disciplines such as Culture Studies. This Programme is a result of the interdisciplinary approach to the paradigms of knowledge. 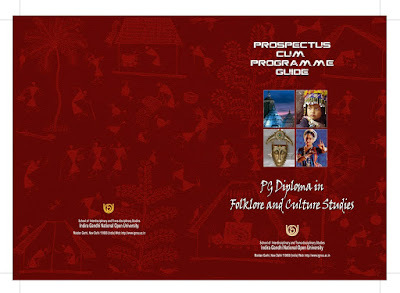 The Programme focuses on themes such as oral literature, material culture, social customs, performing arts, the theories and methods of folklore employed so far such as historical-geographical, historical-re-constructional, ideological, functional, psycho-analytical, cross-cultural, structural and contextual-- all of which demand an inter-disciplinary approach. 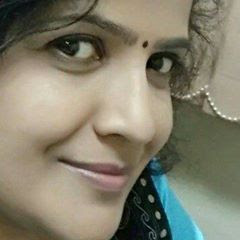 Ø In a vast and diverse country like India, it is important that policy planners are sensitive to the impact of the developmental processes on the marginalized communities. This Programme can contribute to that since it has two major concerns, first, to study the marginal society in their specificity, second, the impact of the contact with more complex societies on the marginal communities as tribes. Ø This Programme seeks to address to that section of students who are not covered by formal education, mainly those students who seek to join the NGO circles or intend to pursue higher education in trans-disciplinary subjects such as Ethnography, Migration Studies, Marginal Studies, etc. Ø It is a scholastic discipline which merges political restrains and sociology, social theory, literary theory, media theory, film/video studies, cultural anthropology, philosophy, museum studies, art history, communication and the appreciation to study cultural experience in various societies. It contemplates on how a detailed phenomenon relates to matters of ideology, nationality, ethnicity, social class, and/or gender. Ø It has the objective of appreciating culture and folklore in all their composite forms and of evaluating the social and political context in which culture manifests itself. 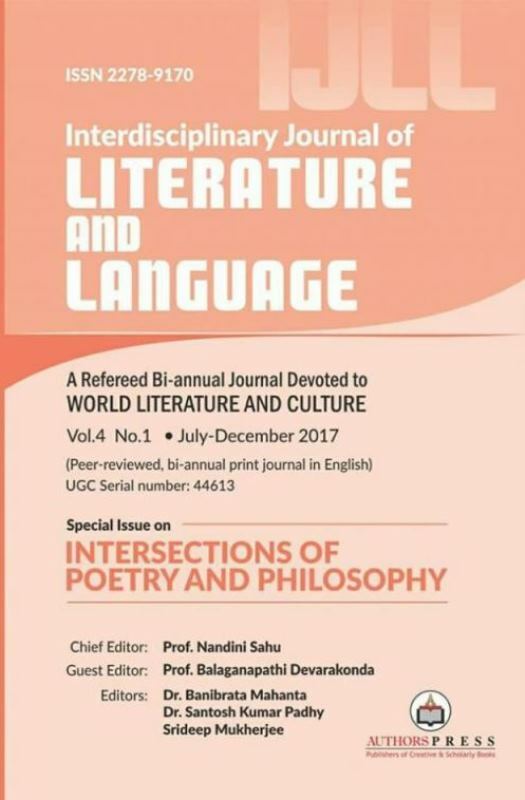 It has the object of study and the location of political criticism by its focal points such as Marginal Studies, Tribal and Folklore Literature, Language Death and Preservation, etc. Ø It has an obligation to an ethical appraisal of traditional as well as the modern society. Ø Some of the important faculty in this Programme may be categorized as: Critical Theory, Cultural Critic, Cultural Geography, Cultural History, Culture Theory, Ethnography, Feminism, Gender Studies, Museum Studies, Orientalism, Popular Culture Studies, Post-structuralism, Social Structuralism, Language Studies, History and Anthropology, etc. Any graduate who wants to enter tourism, archaeological development or management of museums, NGOs working for Tribal Rights, Academic Institutes offering programmes on Folklore and Culture Studies. The Programme is aimed to equip students with the understanding of what is folklore literature—both oral and written-- and culture; as well as to provide them with an outline of methodological tools that are required to understand them. This Programme is distinct as it does not deal with the haute forms of culture, such as written literature or classical music or dance or theatre or cinema. On the contrary, it deals with the folk traditions, such as folk dance, folk music, folk literature or various kinds of folk performances which are closely associated with the lives of a certain community. However, folk traditions are also part of the haute cultural forms. Therefore, the Programme aims to discuss how and why folk traditions are part of these haute cultural forms. the Best MBA College In Delhi as it has earned the reputation in the field of management studies by providing the core knowledge of the subject to their students. At this time, it seems like Word Press is the preferred blogging platform available right now. (from what I’ve read) Is that what you’re using on your blog?